Curling is not one of the world’s most popular sports, nor is it one likely to receive much television coverage or be something many people will ever play. It is though, a fascinating game, well deserving of its nickname of “chess on ice”. Invented in Scotland in the 16th century it is popular in the UK (mainly Scotland) as well as countries to which Scots have exported it, including Canada, the US, New Zealand, Sweden and Switzerland. In addition curling is now played in a number of other countries, including many other areas of Europe, China, Japan and Korea. 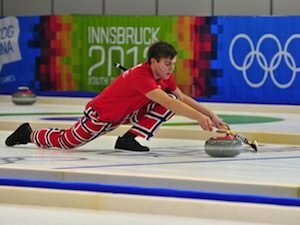 Curling has similarities to bowls and shuffleboard (deck) and involves sliding granite stones, also called rocks, into a target area at the other end of a long, thin, strip of ice which constitutes the “pitch”. The team that propels their rocks closest to the centre of the target scores points accordingly, with the path of the stone influenced by team members who sweep and brush the ice ahead of the stone in order to alter its speed or curl. Curling is played between two teams of four using eight granite stones each. The “pitch” is a flat, smooth area of ice measuring 45-46m long and 4.4-5m wide. There is a “house” at each end, a circular target made up of a blue outer circle with a 12ft diameter, a white circle inside that with a diameter of eight feet and a red circle with a diameter of four feet. The stones themselves weight between 17 and 20kg, are at least 11cm high with a maximum circumference of 91cm and have a handle attached to the top. They are made of granite and the handles are usually red for one side and yellow for the other. The two sweepers who follow the rock down the ice use brushes or brooms, usually made of fiberglass and fabric or horsehair but there are no real restrictions on the materials from which it is constructed. In addition the players wear curling shoes which are broadly similar to standard trainers except that one sole is smooth to enable sliding. Players also usually use gloves, specific curling trousers and a stopwatch to better understand the pace of the ice and the need for sweeping. Scoring is done after each “end” (an end being a set where both teams have thrown all eight stones) with whichever team is closest to the centre of the house being awarded a point. Further points are awarded for each stone of theirs that is closer than the best of the opposition’s. In order to score any points at least one stone must be “in the house”, which is to say touching any of the circles or overhanging them (due to the shape of the stones). The game is won by the team that scores the most points after all the ends are complete. Most curling matches take place over ten or sometimes eight ends. If the scores are level after the allotted number of ends then an extra sudden-death end is played. Teams of four take it in turns to curl two rocks towards the target area with the scores being counted after all 16 rocks have been sent down the ice. International matches have a time limit of 73 minutes per side with two timeouts lasting a minute each. 10 minutes and one timeout are permitted per extra end in the event of a tie. The stone must be released its front edge crosses a line called the hog. Foul throws are removed from the ice before they have come to rest or in contact with other rocks. A stone touched or moved when in play by a player or their broom will either be replaced or removed depending on the situation. The team to go first is decided by coin toss, “draw-to-the-button” contest or, in Olympic competition using win-loss records. Subsequently the team that failed to score in the previous end has the advantage of going last, called the hammer throw. A team may concede if they feel they cannot win, although depending on the event and stage of event they may have to wait until a certain number of ends have been completed. Fair play is of huge importance so there is a culture of self-refereeing with regards fouls and this is a big part of curling.